… and we see that the bryozoan almost entirely covers a brachiopod. So far, so common among Ordovician fossils. However, look closely at the margin of the brachiopod valve and how clearly it is delineated from the bryozoan. It is apparent that the bryozoan had encrusted a living brachiopod, and the brachiopod stayed alive, keeping the essential commissure (the gap between the valves) open for feeding. We are looking at the valve that was in contact with the substrate (the underside of the living brachiopod). The bryozoan occupied the upper exposed surface, growing across that valve (which is invisible to us now), past its edge, but not closing the gap with the other valve. The same bryozoan species is found on the above visible valve, but only as two thin films unconnected to the colony on the upper side. A closer view of the brachiopod hinge shows additional evidence that the bryozoan and brachiopod were living together. The red arrow on the left points to where the fleshy pedicle (attaching stalk) of the brachiopod extended from the shell to meet the substrate. The bryozoan here curves around the now-vanished pedicle. 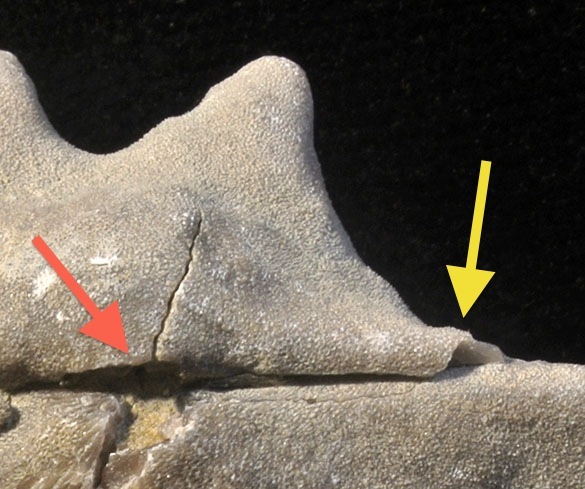 The yellow arrow on the right shows how the bryozoan growth surface folded to accommodate the opening valves at the hinge. Pretty cool. I can’t identify the bryozoan beyond Order Trepostomata without cutting it open. The brachiopod, though, appears to be Hebertella richmondensis Foerste, 1909. 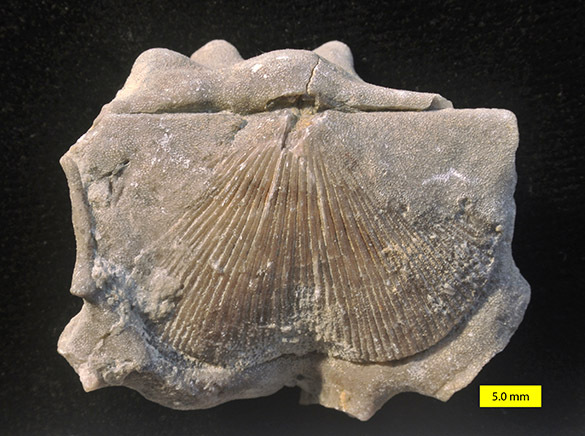 This specimen is from the Whitewater Formation (Upper Ordovician, upper Katian) exposed near Richmond, Indiana. It was collected on one of my field trips in 2003. What do we learn from this little assemblage? We first see a relatively uncommon example of a clear living relationship between a sclerobiont and its host. We also learn that the brachiopod could continue to open its valves for feeding despite the heavy calcitic bryozoan weighing it down. We even can see that this brachiopod was not living on a soft muddy substrate because only a small triangular-shaped area (see above) in the center was clear of encrusters; the thin bryozoan (and maybe a bit of the stromatoporid sponge Dermatostroma) had enough space between the valve and the substrate to feed and respire. None of this is surprising, but it is nice to see our models of how these organisms lived are congruent with the evidence. Alexander, R.R. and Scharpf, C.D. 1990. 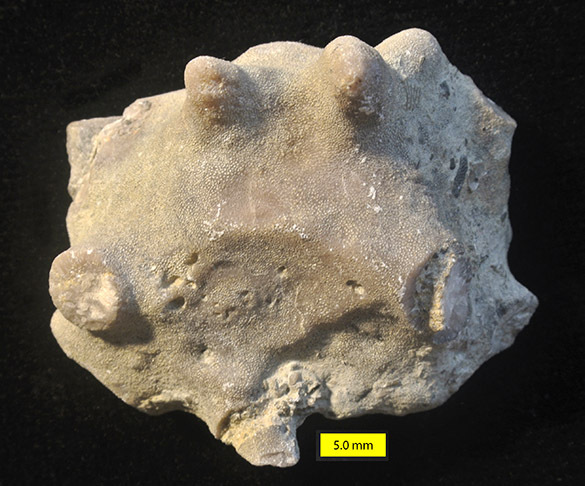 Epizoans on Late Ordovician brachiopods from southeastern Indiana. Historical Biology 4: 179-202. Foerste, A.F. 1909. Preliminary notes on Cincinnati fossils. Bulletin of the Scientific Laboratory of Denison University 14: 208–232. Walker, L.G. 1982. The brachiopod genera Hebertella, Dalmanella, and Heterorthina from the Ordovician of Kentucky. USGS Professional Paper 1066-M.
Wright, D.F. and Stigall, A.L. 2013. Phylogenetic revision of the Late Ordovician orthid brachiopod genera Plaesiomys and Hebertella from Laurentia. Journal of Paleontology 87: 1107-1128.